Pears and ginger are a wonderful combination of flavours. 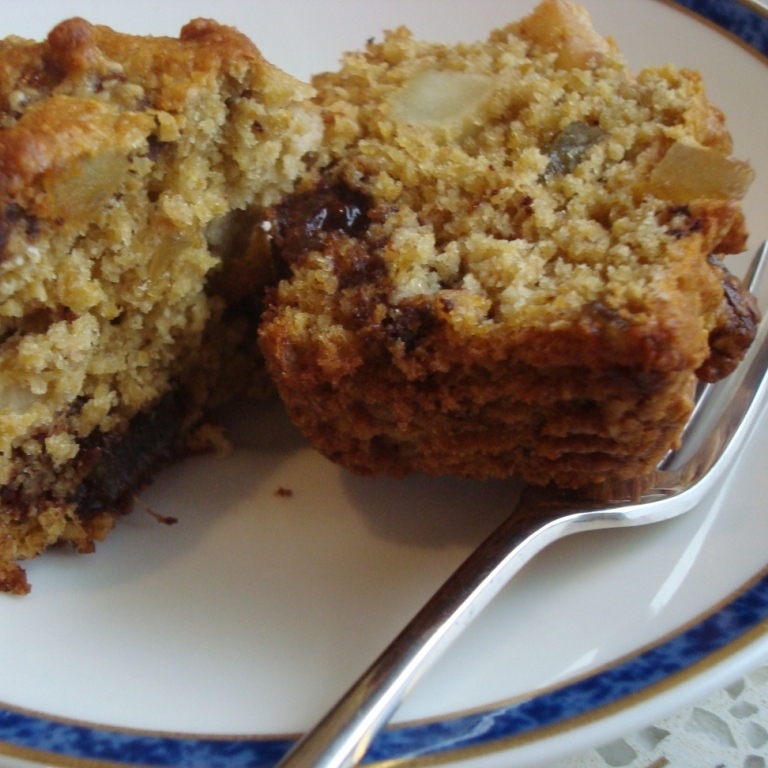 A kind friend gave me some marvellous dark-chocolate coated ginger and I decided to enliven a couple of windfall pears with the few remaining pieces in a muffin recipe. I thought it would stand a fairly robust texture so used an oat-bran muffin as the base. They freeze well. Ten pieces of chocolate coated ginger, cut into 5mm dice. Or use crystallised ginger and a few chocolate chips. Pre-heat the oven to 200 degrees C. Sift the flour, baking powder and ground ginger into a mixing bowl. Stir in the bran, pear, crystallised ginger and chocolate. Put the butter, syrup and sugar in a pudding basin and put it in the warm oven to melt together. Remove from the oven and stir in the baking soda and the milk. Add the beaten egg and mix well. Pour the liquid ingredients into the dry ingredients and fold together until just combined. Divide into 12 muffin tins (I used paper cases) and bake for 15-20 minutes until golden and firm.